This is the story you've been waiting for. Now you don't have to buy his third autobiography when it comes out. This video was quite sensitive to Dear Leaders, er, um, sexual preferences, shall we say. This was admirable, not to include anything about Larry Sinclair. Yes, the KFC being thrown at Dear Leader is racist! However, it could have been worse, you know. Thank goodness it wasn't pork or bacon. Then it would have been blasphemous. And if this woman would have stood up in front of Dear Leader, it would have killed two birds with one stone. 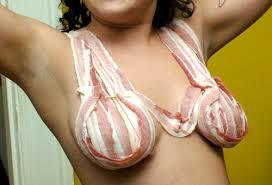 In case you can't tell, she is wearing a bacon brassiere.